not in your electric bills. We have found that most AB Distributors have refrigerated CEWs due to the old and more stringent temperature setpoints by A-B. We’re now finding that most new AB facilities are built with mid-temp air conditioning systems in the CEWs, which is an expensive uplift for an existing facility. CEWs, Keg Coolers, and for some of you now who have draft coolers with refrigeration are wasting a great deal of money year over year on the evaporators running at high speed when they don’t need to be. Fortunately we have a proven, cost effective, and common sense solution to fix this problem. 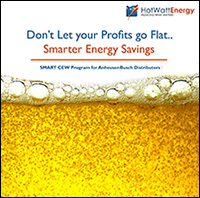 We have partnered with many Anheuser-Bush Distributors across the nation to help energize their beer business using our SMART CEW Program. Many of them have seen an average ROI of 18-24 months. We would like to help you to save money, reduce noise, and reinvest wasted operating expenses back into your business. We have found that most Miller-Coors facilities utilize Chillers and Air Handling in the mid-temp CEW/Warehouse areas. Your Keg Coolers, and for some of you now who have draft coolers with refrigeration are wasting a great deal of money year over year on the evaporators running at high speed. We are able to help reduce the waste in all parts of your facility by implementing our SMART CEW Program. A typical M-C Distributor has a project Payback of 18-36 months, and will save thousands or tens of thousands depending upon the size of the facility over the life of the system. Register for a 30 minute discussion to learn about how we can help improve your facility and your profitability.